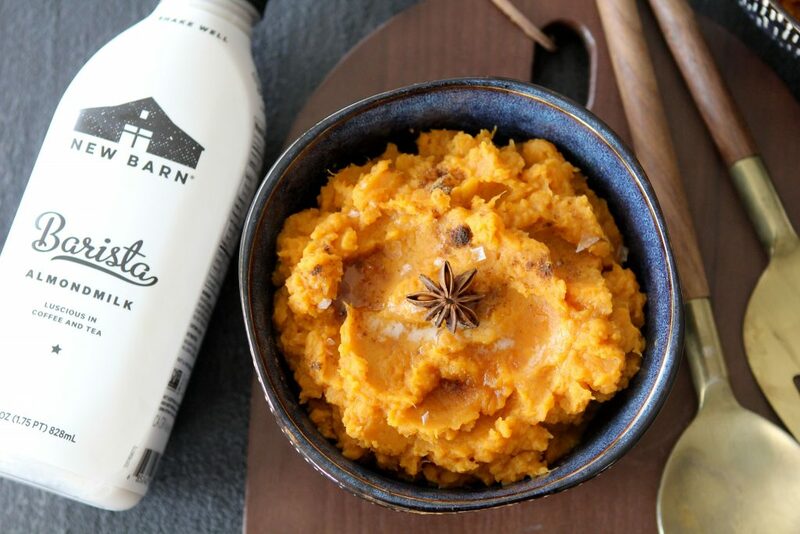 This Chai Spiced Sweet Potato Mash from the Whole Smiths is brought to you in partnership with New Barn Organic Almondmilk. 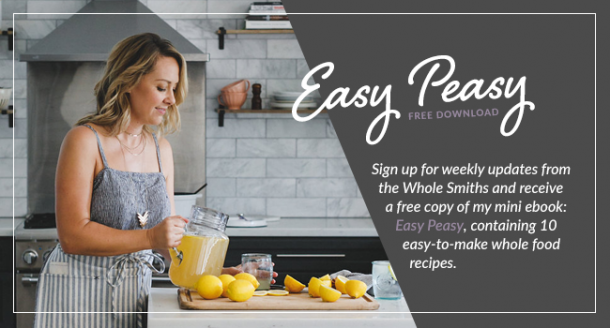 It’s a perfect alternative to overly sweetened sweet potato casseroles. 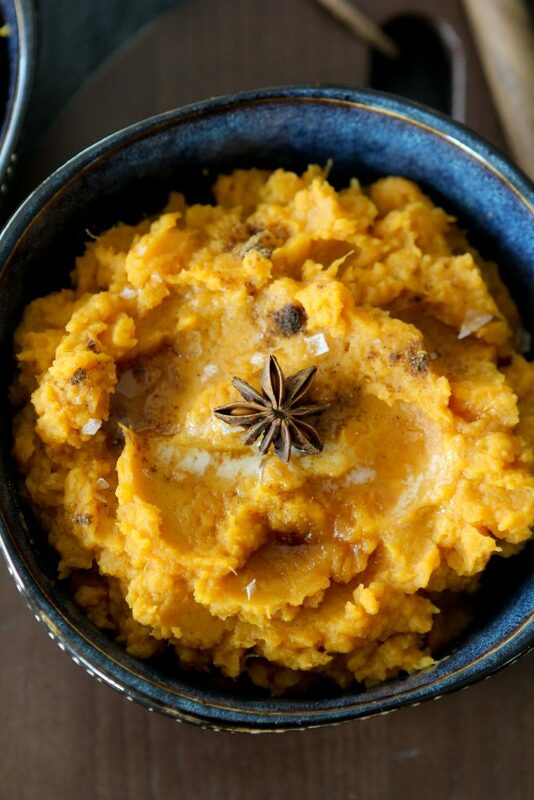 While it makes a great Thanksgiving side, it’s also a dish that you can enjoy year around. As we approach Thanksgiving I’ve come to the realization that today’s sweet potato casseroles often seem like they are more of a dessert than a side. They’re loaded up with marshmallows, cookie crumbles, brown sugar and I’ve even seen some with Dr. Pepper mixed in. 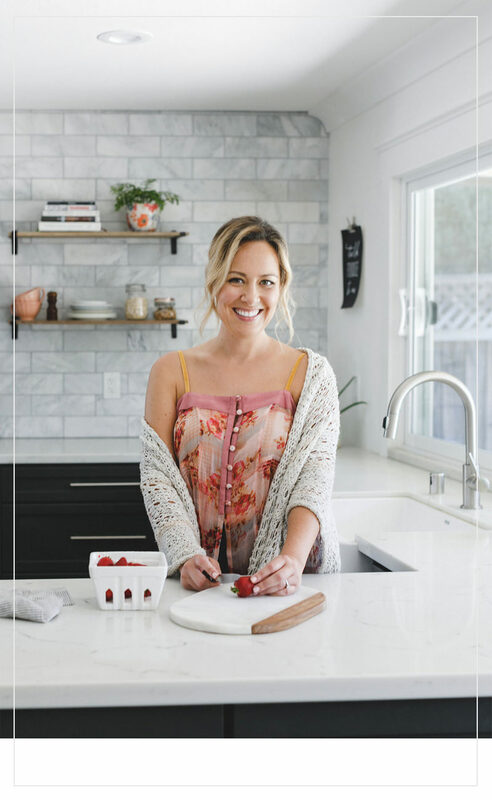 While I don’t doubt how delicious all of these recipes must be, at what point do we start considering them dessert? My mom makes one every year and as a kid (and even today) it’s one of my favorite dishes. Gee, I wonder why?! It’s delicious. But hardly a side. It’s a dessert sneaking into the main show. 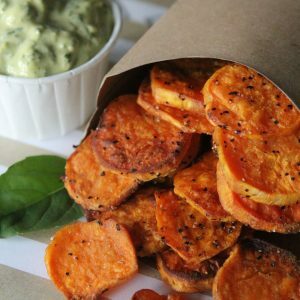 Let’s not put all of the blame on poor sweet potatoes though, it seems every veggie dish has become a beacon of gluttony. There’s so much cream, cheese, and bacon added to them sometimes it’s hard to find the veggies. And don’t get me wrong, it’s delicious. I love me a good dish like that (see my Gluten-Free Cauliflower + Bacon Gratin), let’s not do that for every dish. I approach my Thanksgiving menu with balance. I recognize the day is more about the memories and showing our gratitude than the calories we’re consuming. But I also want to be able to do that without feeling like a bloated zombie afterwards. So while I will incorporate a bit more dairy and sugar into our dishes than we usually eat, I try to keep things reasonable. 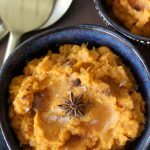 I knew I wanted to create a yummy sweet potato dish for this post and my mind immediately went to a casserole. 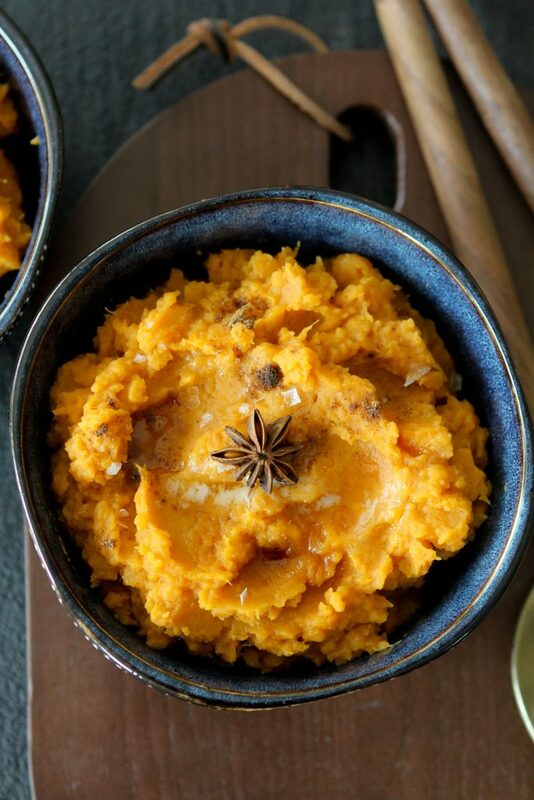 After poking around a bit at other recipes I realized there was an opportunity to create a delicious, decadent sweet potato side without all of the extra sugars. However, I wanted the dish to still feel festive and special. Being a huge fan of New Barn Organic Almondmilk, I knew their products would be fantastic in this dish. I had originally planned to use their Unsweetened Vanilla variety but quickly realized their Barista blend would give this dish the perfect decadence I was looking for. While I usually use Barista in my coffee drinks (see my Paleo Dirty Chai Latte) it’s also a perfect replacement for cream in so many dishes. 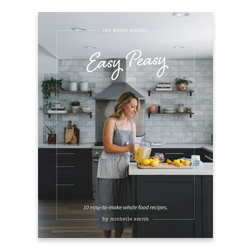 So often recipes call for coconut milk as a creamer in place of heavy cream but if you’re looking avoid any coconut taste, that’s just not going to cut it. New Barn Barista is sweetened just slightly so it’s not going to taste sugary and the consistent texture will lead to smooth, silky perfection. It’s not just for your coffee people! 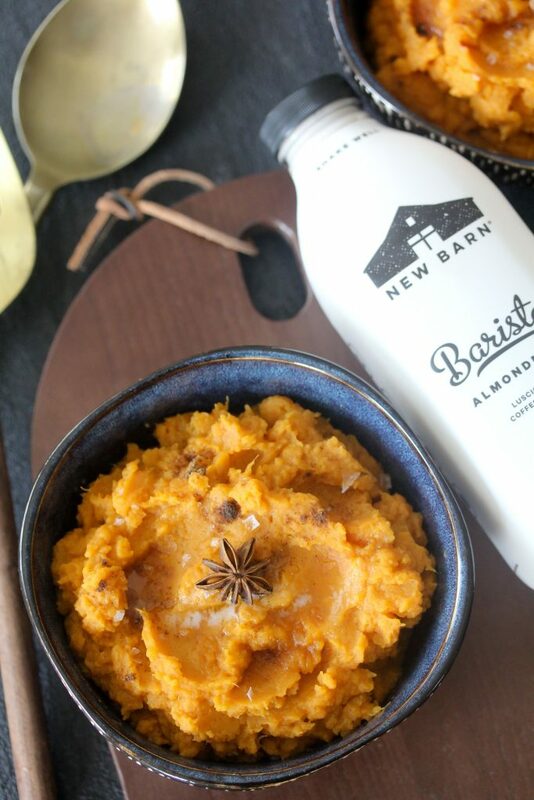 If you’re looking to make this Whole30 compliant use the following modifications; replace the New Barn Barista blend with the New Barn Unsweetened variety, omit the maple syrup and make sure to use ghee rather than butter. You can head here to find your local New Barn retailer. Thanks to New Barn I was able to nail the texture of this down. Next up was the flavor. I know cinnamon is an easy spice to add in (and you still can if you don’t have chai on hand) but I wanted something a bit more interesting. I absolutely love the complexity that chai brings to any dish. It feels more special to me. Here’s what you need to know though. It may seem like a no-brainer to some of you but I’m sure some will ask. This is not the same as using your tea. Don’t bust open a tea bag and add it in. Please. You need a chai spice blend. 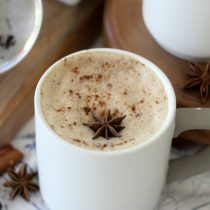 I use a chai spice that I sourced on Amazon and absolutely love it. You can find that HERE. Last minute? I have you covered. 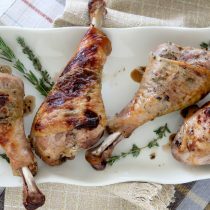 This recipe is a breeze to make and is sure to be a crowd pleaser for Thanksgiving or any special occasion. Or even a Wednesday. It’s easy to assemble and travels well. You can make it the day ahead and reheat it up, no problem. So if you find yourself scrambling trying to figure out what to bring to your boyfriend’s family this year, this dish will no doubt get you through. I don’t have a solution for his Uncle’s bad jokes though. 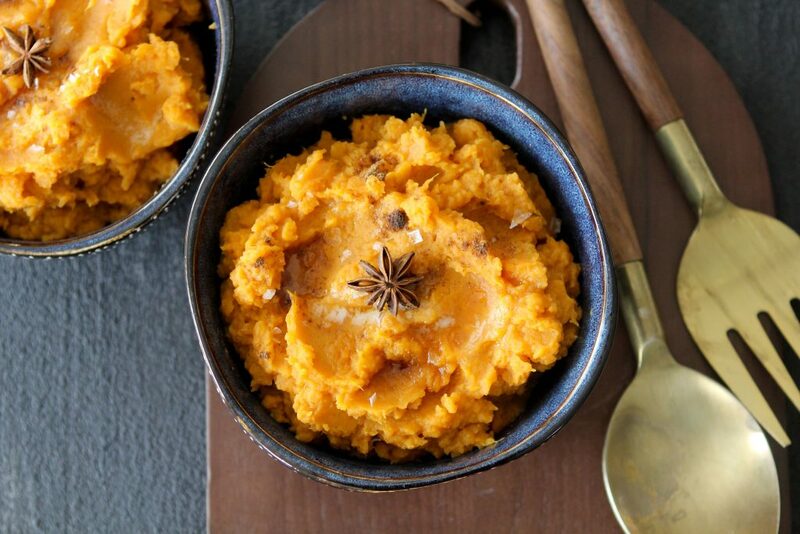 This Chai Spiced Sweet Potato Mash from The Whole Smiths takes your sweet potatoes to the next level. It's dairy-free and decadent! Add the sweet potatoes to a large stock pot and fill with water, just enough to cover the top of the sweet potatoes. Bring the water to a boil and boil the sweet potatoes until they are fork tender. Turn off the heat and drain the potatoes in a strainer. Return the potatoes to the stock pot. Add the almond milk, ghee/butter, chai, maple syrup and salt to the stock pot. 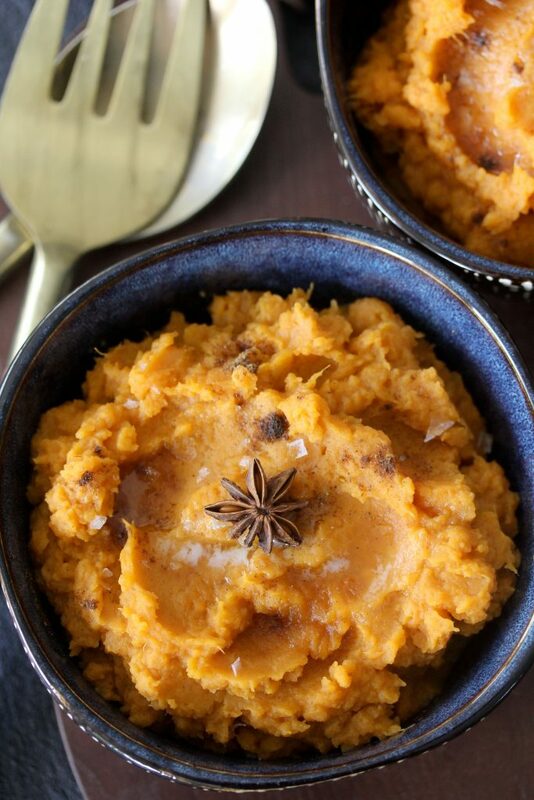 Using a hand blender, mix the sweet potatoes on medium until they are smooth and creamy. Serve with a small amount of additional ghee or butter over top, a light drizzle of maple syrup and a sprinkle of salt over top.